If you've never heard of Polartec® NeoShell® fabric, let the Millet Touring Neo jacket be your introduction. With an amazing breathability of 2L/m²/sec, you will only need to use the pit zips when all out sprinting. The magic fibers that somehow let out that much moisture also achieve a waterproof rating of 10,000mm with a 245 g/m² durable water resistance coating. To put all that into English, you will always be comfortable in this shell specifically designed for ski touring by a company with lots of mountain experience. 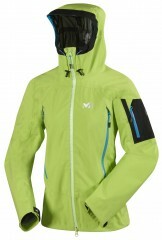 Specifically designed for ski touring with a female cut by Millet. 3-layer protection with Polartec® NeoShell® 3L Stretch as the primary membrane. Thermo-sealed seams for maximum waterproofness. Integrated Easy-Hood™ with protective visor optimizes your panoramic vision. Flex Comfort™ ergonomic build with pivot sleeves. 2 large water-repellent zipped chest pockets for venting and storage (think skins).. Extremely tough yet weighs only 410 grams (14.5oz).